Get answers to your questions about the security of Secure Contracts, signing digital documents, using Secure Contracts on a mobile device and more. Is Secure Contracts really secure? What steps are taken to maintain the document integrity throughout the signing process? Are e-signatures proof of the person signing the document? How do I know that my e-signature has not been stolen? All communications on the site and all documents emailed through Agreement Express are encrypted with full 128-bit SSL security. Your account and all your documents on Agreement Express are password-protected and no one can access your data unless granted permission by you. Agreement Express servers are housed in secure facilities with power and Internet backup. With the added security of a required login combined with a PDF document accessible only through encrypted links, digital signatures are far more secure than fax machines and the postal service. 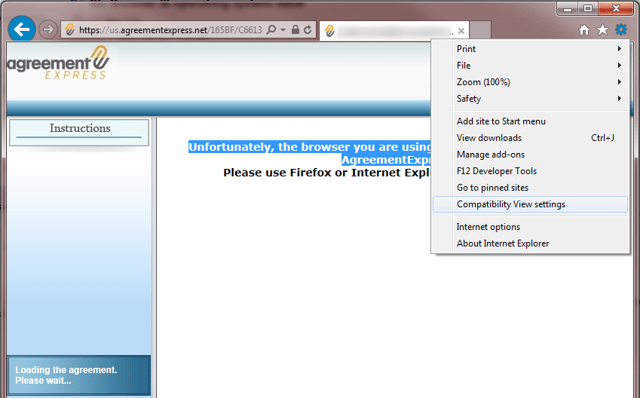 In fact, the actual digital document never leaves the Agreement Express system. When a person signs a digital document with Agreement Express, there are several actions that occur to ensure the integrity and legal authority of the document. All interactions with documents are tracked to create an audit trail. Whenever someone views, signs, or clicks Save Agreement, a record is made. 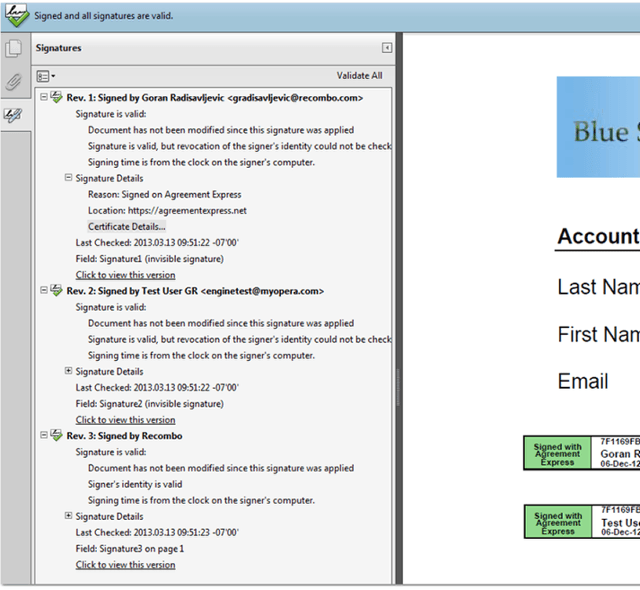 This audit trail can be viewed from Agreement Visualizer and from within the document itself. After all parties have signed the digital document, Agreement Express completes the audit trails, and the document is signed with the Recombo signing certificate. This not only creates a permanent record of the document at the last point of signing, but also creates a trail that can be followed from the PDF copy. 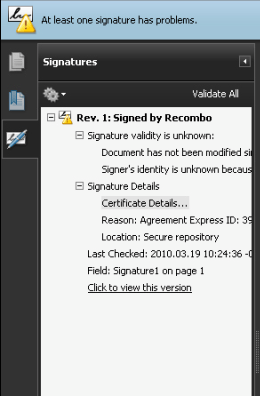 If you open a digital document from Adobe Reader (or any other PDF reader), and Recombo is listed as a Certificate Authority, you will see “Signed and all signatures are valid” at the top. When you expand on the signature details, you will also find the Recombo signing certificate embedded in the PDF as “portable proof” that the document has not been altered since it was signed. In addition to the Recombo signing certificate, new customers use Personal Signing Certificates (PSCs), which are one certificate per signer embedded in the PDF. Every PDF downloaded contains the trail of signers embedded with an audit trail of time stamp. Yes. Digital contracts and e-signatures are completely legal for business use under the Electronic Signatures in National Commerce Act, the Uniform Electronic Commerce Act and the Personal Information Protection and Electronic Documents Act (PIPEDA). Documents that are signed online with secure compliant signing software are as valid and binding as ink-based signatures. Assurance that a forged or tampered electronic agreement can be detected. The level of security on a signed digital document is much higher than on a paper document due to the nature of the media. A paper document only involves a pen and a piece of paper; whereas a digital document must involve access to the signer’s email account, the password for the person’s registered electronic signature, and access to the document to be signed. The only way your e-signature can be stolen is if a thief gains access to your email account and knows the password to your Agreement Express signature authentication. NEVER give your Agreement Express password to anyone. Can Secure Contracts be opened with a mobile device? Do the documents need to be modified for mobile use? How to use Agreement Express on a mobile device? Yes. TELUS Secure Contracts is powered by Agreement Express. 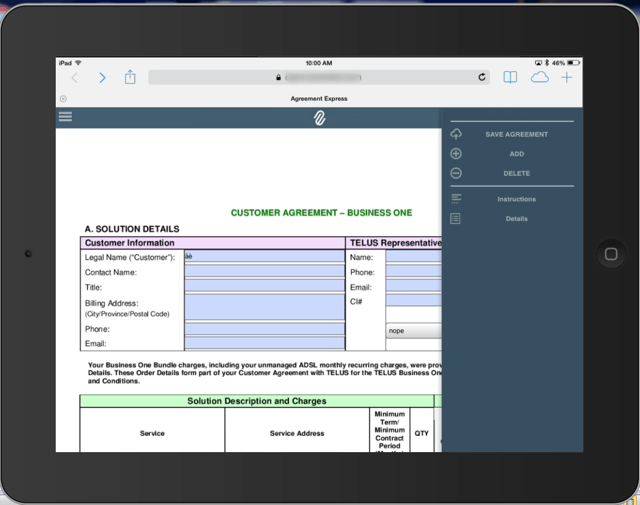 Agreement Express enables digital documents to be opened on a mobile device without requiring downloads or program installation. When a signer clicks on the link in the email from a mobile device, Agreement Express automatically detects the device type and opens the document in the default browser. The document will be in portrait or landscape depending on how the device is oriented, provided the device supports orientation detection and it is not locked. Like the Flash-enabled interface, signers will be guided through the process by an arrow. After each signature, they will be prompted to go to the next document requiring their signature. When they’ve completed signing, signers will be prompted to click Save and Send. 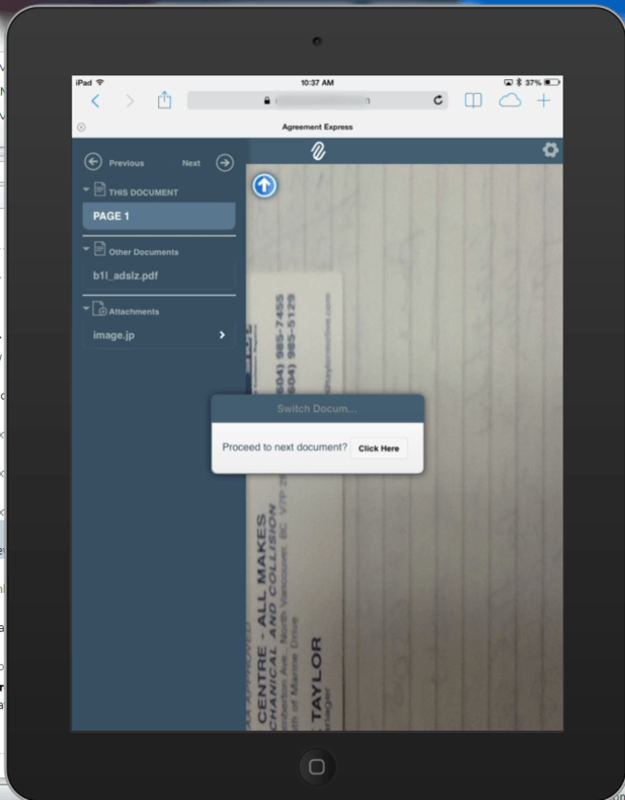 For security purposes, none of the document(s) is retained on the mobile device. In order for a signer to use Agreement Express on a mobile device, the company sending the document must have mobile enabled. 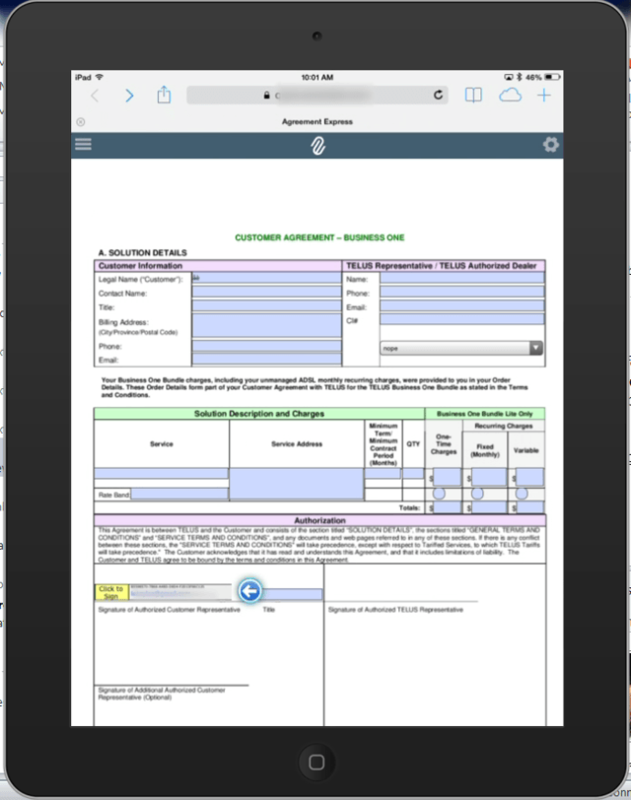 Please contact Recombo Support for information on enabling digital documents to be opened on mobile devices. 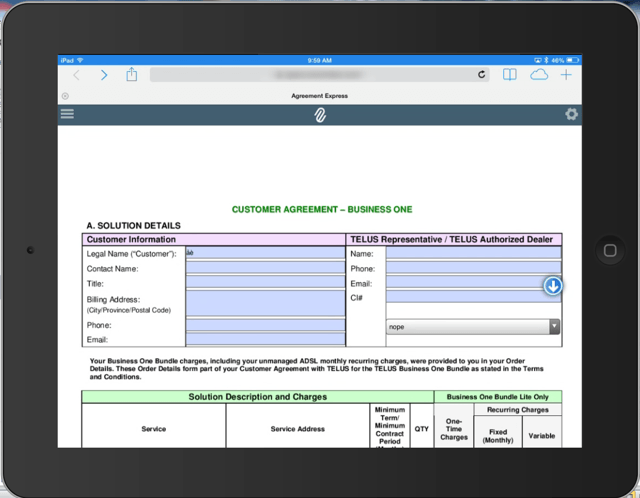 No modification is required for the Agreement Express templates to be used for mobile. However, traditional paper-based documents and templates are usually not suitable for mobile devices due to the size and location of radio buttons, check boxes and other features. If using paper documents, the base form should be redesigned or landing pages used to pre-populate the templates. Click on the icon in the top left corner to reveal a list of pages in the digital document. Click on a page, and the active document is displayed. Pages with signatures are identified with the pen icon next to the page number (indicated above with the yellow arrow). If the document is a part of a package, other documents will be listed below. They can be collapsed or expanded by clicking on the header icon. For optimum performance, it is best to move through the document sequentially. Click anywhere to hide the menu. Save Agreement: Save any information that has been entered on the document within Agreement Express (but not locally on the device). Note: Signed signature blocks are not saved until the signer clicks Save and Send. Add: Add an attachment from the device’s photo library, directly from the camera, or add another template, if permitted. Instructions: Display the signing instructions associated with the document or template. Details: Display the viewing, signing and other relevant history of the document. Click anywhere to hide this menu. Like the desktop version, an arrow guides the user through the document indicating required fields, where signatures are required, and when to switch to the next page or document. If the arrow is blocking your view, simply tap it and it will disappear temporarily. Clicking on the arrow will not "page down" however (as it does in the desktop version) as scrolling on a mobile device is more efficient. 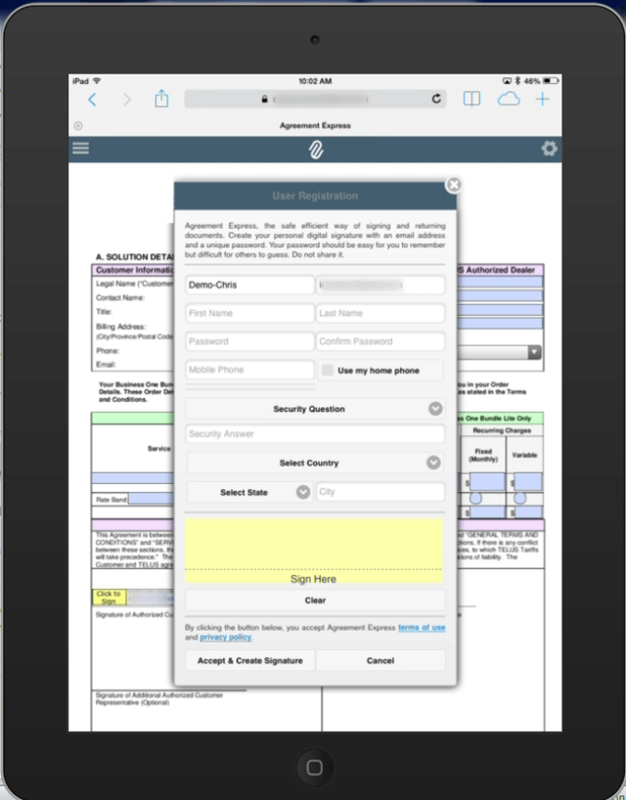 The registration panel is the same on a mobile device as it is in the desktop version, with the exception that signers can also write their signature. This does not take the place of the digital signature. This written version of an individual's signature is used as a watermark beneath the digital signature on the signed document. It is NOT necessary to write one’s signature, but it does provide an extra security measure for the signer, and may be required by some companies. 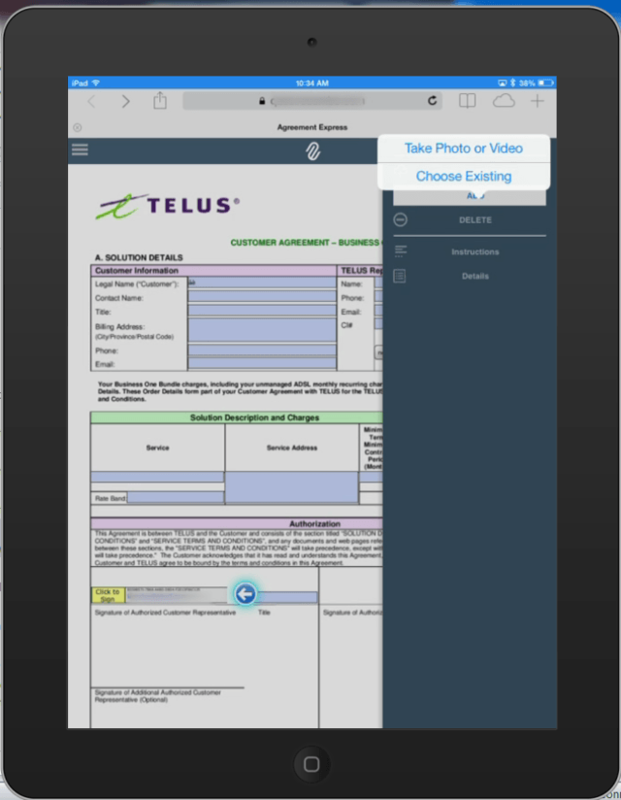 To add documents from the right menu, such as a driver's license or passport, touch Add on your tablet and then select to use either the camera or from the hard drive. If you choose a camera image, the image will be uploaded automatically, and the image will not be stored on your camera roll or photo library. If you want to save a copy, take the picture, and select Browse. The default name for a photo attachment is "image.jpg". You can use the default, or create a new name. It is not necessary to put the .jpg extension. When you have completed signing a document, a Switch Document panel will inform you if there are further documents that need your signature. Click this to go to the next document in the package. If you wish to continue reviewing the document, click anywhere and the dialog will disappear. If you dismiss this panel, you will need to use the left navigation menu to go to the next document. I received an email requesting my signature on a digital document. What do I do now? I don’t have an Agreement Express password. Do I need to create one? How will I know where I have to sign on the document? When I opened the PDF from Agreement Express, I got a warning message stating “At least one signature has problems.” What does this mean? I’ve signed the document, but now I am not able to make any edits. Why? I have signed the document, but I notice that other signatures are still required. What happens now? I received a digital document for a signature, but I am not the person who is intended to sign it. What do I do? Another signer has just signed the digital document, but I am not able to add my signature to it. Click on the link in the email. 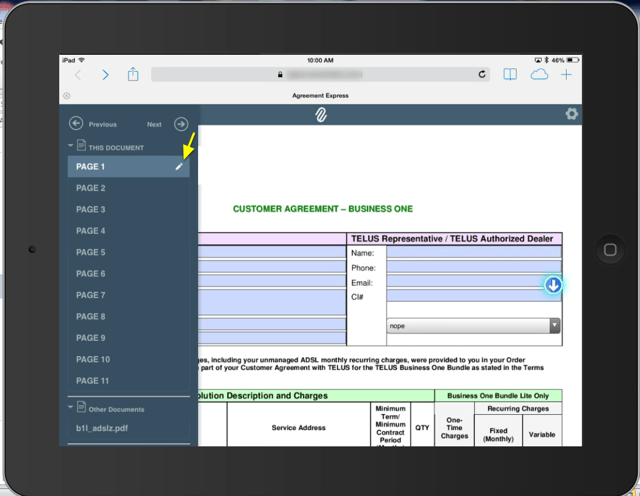 It will take you a page with an Agreement Express digital document. An arrow will guide you through the document. If you aren’t already registered, you will be asked to register when you first click on a signature block. Otherwise, you can simply enter your password where prompted, and click ACCEPT. Once you have signed where the arrow has indicated, click SAVE & SEND. Yes, you do. When you click on the first signature block in the digital document, a registration panel will appear. You can register and create your password at this time. Your password can be used for any future Agreement Express documents that are sent to you for your signature. For more information on your Agreement Express password, see the General FAQs. An arrow will guide you by pointing to the fields that need to be completed, or areas where you need to sign. The system also informs you if there are additional documents that you need to review. This message is an indication that you haven't added Recombo as a trusted identity, so your PDF reader doesn't know what to validate the signatures against. This is a security measure to ensure the document’s validity. You should receive a confirmation message. When you close the window, the warning message should change to “Signed and all Signatures are valid”. Once a digital document has been signed, Agreement Express locks it to prevent further modifications. This is to comply with Electronic Signature laws. Now you wait until the others have signed the document. Once the document has been signed by all parties, each signer will receive an “Agreement Completed” email with a link to the completed document, which can be viewed and saved for future reference. If you are sent a digital document and you are not the right person to sign, please contact the sender immediately. Provide the correct email address for the person who should be signing the document. This is because another signer has signed the document since you opened it. The system is designed to prevent you from signing an older version of the document. Please close and re-open the document, and you should be able to sign it. This may be because you are trying to sign that signer’s version of the digital document. Be sure to open the document from the link sent to your email address. To prevent unauthorized individuals from signing a document in your place, all signers are sent a unique link that only allows the email recipient to sign. Can my Agreement Express account be used for transactions with other companies that use it? How can I view the documents I have signed through Agreement Express? Can I download a copy of a completed digital document? I can’t find the confirmation email stating that I signed a document. Can I get it resent? Can a digital document be forwarded to someone else for signing? I received an email with an attachment to a digital document, but I can’t click on anything. I clicked on the attachment link in the email but my browser displays a blank grey/black page. Help! I get this message: "Unfortunately, the browser you are using is not currently supported..."
How do I create my Agreement Express Password? How do I change my Agreement Express password and/or security question? I forgot my password. Is there a way to retrieve it? What if I have also forgotten the answer to my security question? What are the requirements for an Agreement Express password? 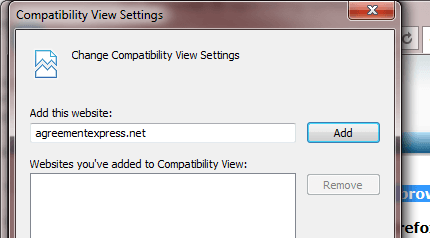 What browsers are supported by Agreement Express? Yes. Your Agreement Express username is your email address, and it can be used to receive digital documents through Agreement Express. Once you choose your password and security question, you are ready to use Agreement Express with any company or person who also has an Agreement Express account. The documents you have signed are always accessible either from the link you used to sign the documents or from the confirmation email you receive after the document is signed by all signers. If you have access to Agreement Manager, you can log in to see all the documents you have signed and/or published. Yes. Download a PDF copy of the document by clicking on Print or Save Agreement. Depending on your browser settings, you may be prompted to open or save the PDF or it may open right in your browser. Yes. Please contact the person who originally sent you the digital document to sign and ask for a copy of the signed document. As a general rule, no. A digital document cannot be forwarded to another signer. In fact, you wouldn’t be able to sign a digital document that was forwarded to you by another signer. The only way to sign it is to use the link sent to your email address. As a security feature to prevent unauthorized individuals from signing a document, all signers are sent a unique link that only allows the email recipient to sign. However, some documents are specifically designated to allow an alternate signature, and may be forwarded to another person to sign. This message will be displayed if you haven't added Recombo as a trusted identity. Without that, your PDF reader doesn't know what to validate the signatures against. Some email clients strip emails of any links for security purposes. Please contact Recombo support to be sent a usable link. Please ensure that the browser you are using has the Adobe Flash player installed. Once installed, close the browser and click on the link that was sent to you to launch the digital document again. Those still using Recombo Waypoint and the old interface on Agreement Express may encounter an unsupported browser message in Internet Explorer 11. This can be resolved by enabling compatibility view in Internet Explorer. In the top right corner of Internet Explorer, click on the gear icon and select Compatibility View settings from the dropdown menu. In the new window, the website address should be auto-populated. Click on Add and then Close. Internet Explorer should refresh and load the agreement. When you open a digital document, click on any of the areas where you have been asked to sign and fill in the registration panel. If you are a Publisher or Company Administrator in Agreement Express, you can log into Agreement Manager and click on Settings in the top right corner to change your Agreement Express password and/or security question. If you do not have access to Agreement Express, click on Forgot Password when signing a document to receive a password reset link. Or contact Recombo Support for assistance. Not as a general rule. However a company may have set passwords for their users (including those they sent documents to) to expire. If so, you will be notified when the password is expiring with a change password link. No. If you forgot your password, you will need to set a new one. To do this, click on a signature area of the document, and select Forgot Password in the password field. You will be asked for your security question. Answer the question. Click OK. If the answer is correct, you will be sent an email with a link to set a new password. When prompted for your security question, you can click on Forgot Answer to set a new one. Agreement Express passwords must be at least 6 characters. However, for security reasons, companies may have also set their own password requirements. When creating or changing your password, you will be advised of the requirements.